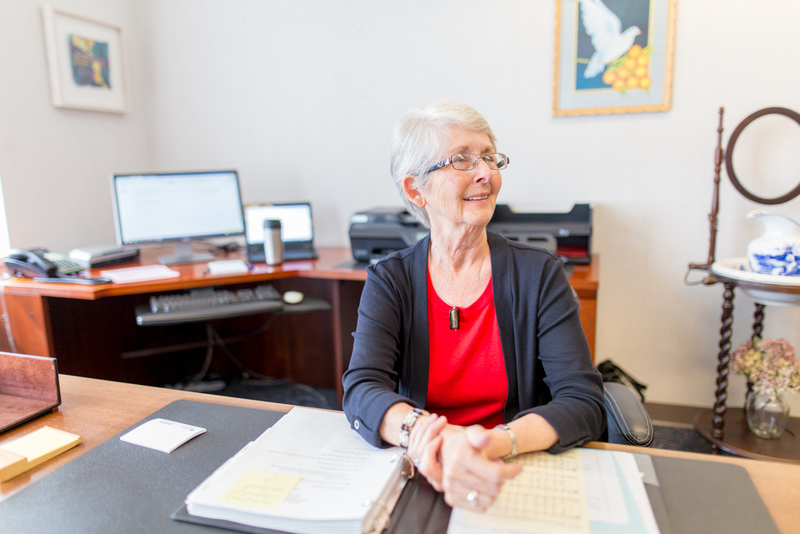 Just a few minutes into her first day of work at Eastern Mennonite University (EMU), Interim President Lee Snyder was greeted with a pleasant surprise. This surprise was an “old friend,” a large oil painting by abstract impressionist artist Warren Rohrer ’50 that had graced the walls of Snyder’s office when she was dean and provost several years ago. Noting the bare walls of the presidential suite as he welcomed Snyder this morning, Provost Fred Kniss had returned to his office and brought with him the painting. Gifted by the artist to EMU in 1986, the canvas is primarily delicate variations of eggshell blue, overlaid on a darker base apparent on the lower edge. Titled “Different Situation,” the artwork now hangs on the wall opposite from Snyder’s desk. Snyder, who replaces President Emeritus Loren Swartzendruber, begins her six-month interim appointment today. EMU’s tenth president, Dr. Susan Schultz Huxman, will begin Jan. 1, 2017. As she settles in, Snyder says she has several formal and informal meetings scheduled through next week, as well as a campus tour to view some of the architectural and organizational changes to campus since she served as interim provost for the 2008-09 academic year. Snyder, who holds a doctorate in American and Victorian literature from the University of Oregon, brings many years of higher education leadership to the interim role. In addition to serving as interim provost at EMU, she filled the same role for the 2014-2015 academic year at Goshen (Indiana) College. From 1996 until retiring in 2006, she served as the eighth president of Bluffton (Ohio) University. Previously, she was vice president and academic dean for 12 years at EMU. She came to EMU in 1974. Until 1982, she taught part-time in the humanities and in English, and was an assistant in the dean’s office. She was named academic dean in 1984 and then assumed the responsibilities of vice president as well in 1987. A native of Harrisburg, Oregon, Snyder attended EMU for one year and earned a bachelor’s degree from the University of Oregon. Later she earned a master’s degree in English literature and linguistics from James Madison University and returned to University of Oregon for her doctorate. Snyder and her husband, Delbert, taught in Nigeria from 1965 to 1968. Her many board and association assignments include: moderator of Mennonite Church USA, chair of the China Educational Exchange Board, chair of the Executive Board of Mennonite Church USA and a member of Mennonite Health Services Alliance Board of Directors. Snyder and her husband, who have two adult daughters, now divide their time between Salem, Oregon and Harrisonburg, Virginia. They are members of Community Mennonite Church, in Harrisonburg, and associate members of Salem Mennonite Church in Salem. We wish you a great six months, Lee! You’ve got the presidential experience from your years at Bluffton University! Our prayers! Lee: All I’ve got to say is, “You GO, GIRL!” Remember that in all situations God is with you –a wonderful resource.